The Pi Zone | Project blog for The Pi Zone Facebook page. 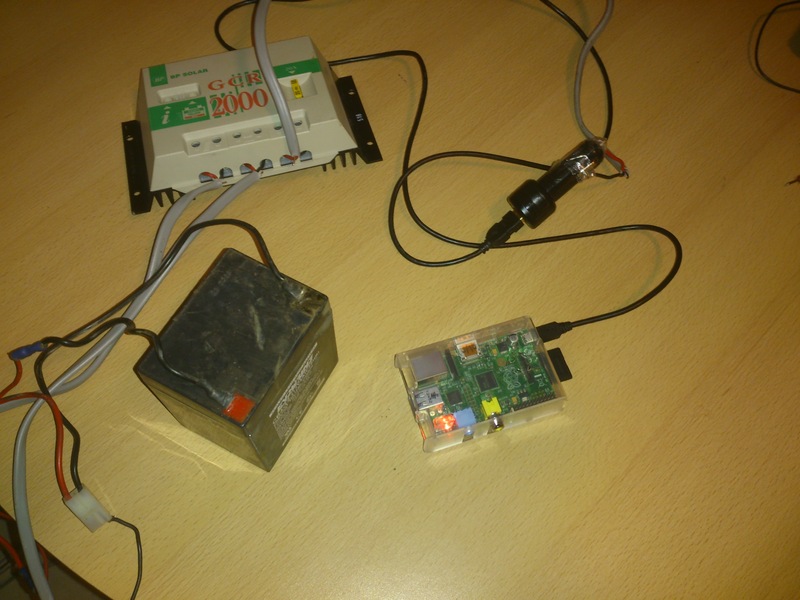 Project blog for The Pi Zone Facebook page. 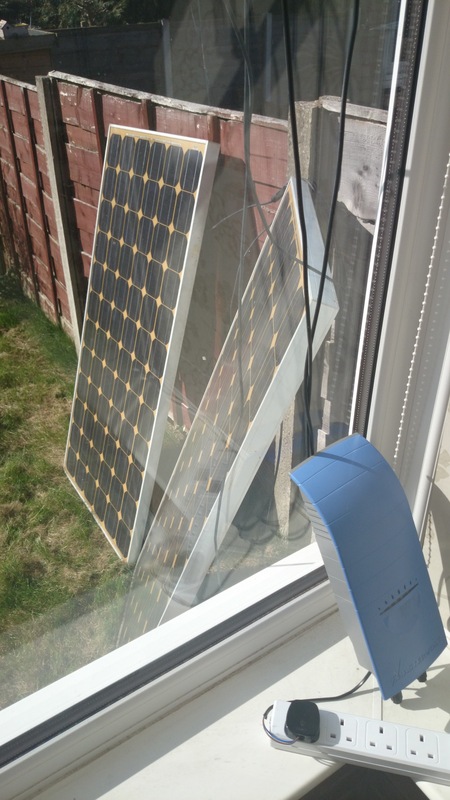 Well had a bit of sun yesterday so decided to do a quick test of connecting 2 of the 170 watt panels to one of the Soladin 600 inverters. It wasn’t the most professional of tests, but did the trick. 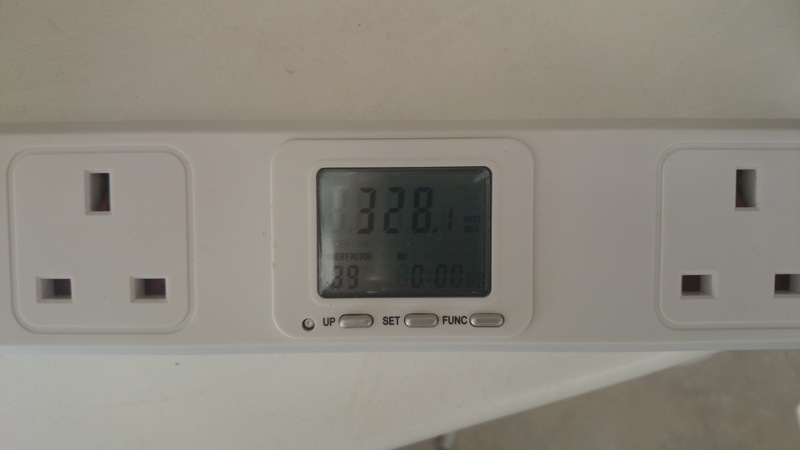 In full sun the panels maxxed out my power meter at 328.1 watts for most of the day, I really need to get a proper one! But for 6 year old s/h panels, shoved up against a fence, I’m a happy bunny. (It covered my working from home, power consumption yesterday anyway). One idea that has sprung to mind with all the news over the bitcoin shenanigans (although not likely to actually make any money), is to run a small RasPi based bitcoin rig, with the power usage negated by these panels. Obviously weather has a lot to do with it but i reckon averaged out, I should be able to run 1 RasPi, 2 usb 1.6ghz asic’s and a usb fan for free, with juice left over for a separate RasPi project. I’ve managed to get a cheap Antminer u1 usb asic and a suitable powered hub, that are currently winging there way to me> Once I get it configured and I’m used to the setup, I’ll add another Antminer, if nothing else it should be an interesting project. This entry was posted in Uncategorized on March 14, 2014 by The Pi Zone. Well I managed to get my hands on 4 Soladin 600 micro tie inverters. The plan will be to split the 4 x 170 watt panels I have into 2 arrays, each array connecting to a Soladin, which will in turn connect to the mains. The next step will be to get mains electrics connected to the garage, although with a possible house move on the horizon we will have to see. The Soladin’s do have a pc link port to export solar generation data, so I’ll be looking to use a couple of RasPi’s running solget to handle the data. This entry was posted in Uncategorized on January 20, 2014 by The Pi Zone. 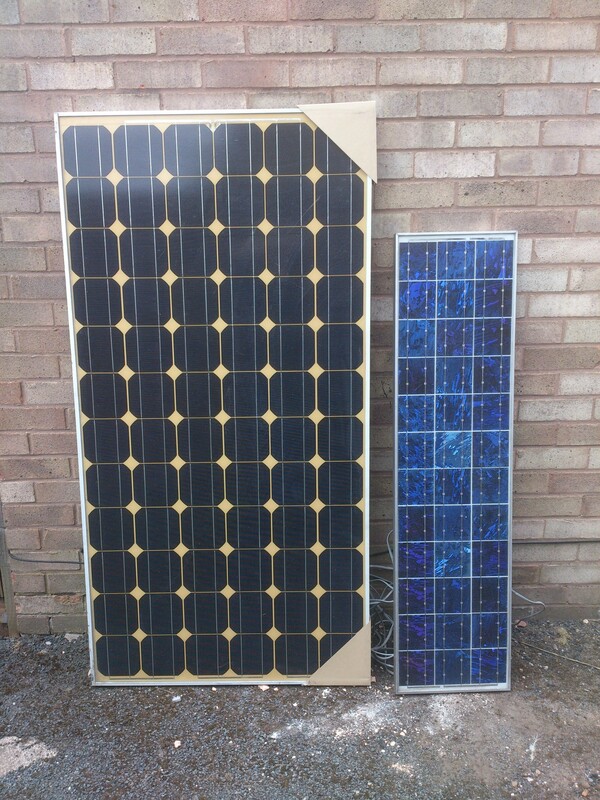 The 170 watt panels have turned up. 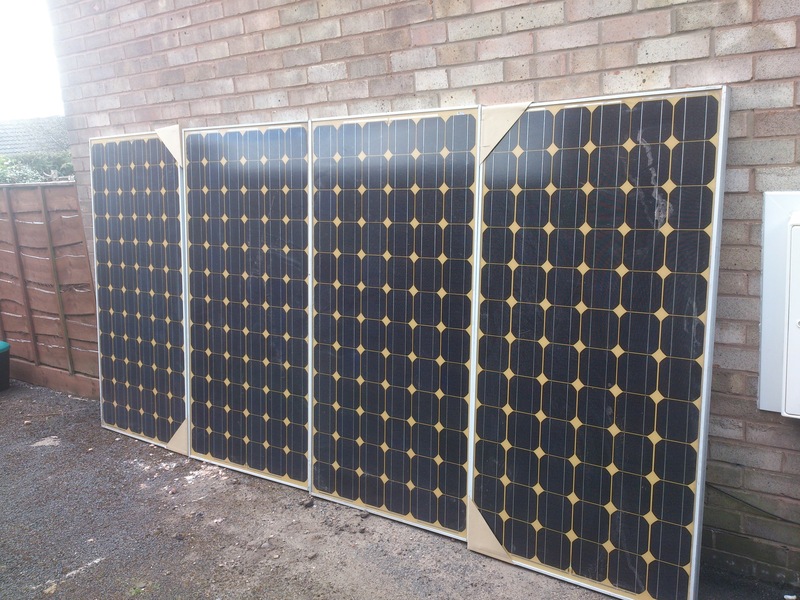 The four 170 watt panels have turned up! I knew the size when I bought them, but how come when things actually turn up they seem massive. One of the 36v 170watt panels compared to my current 12v 50 watt panel. Now I just need to get some mc4 extension cables and then hunt down a cheap micro grid tie inverter, the Mastervolt Soladin seems to be the best but are pricey. Hopefully work will quiet down a bit so I can crack on with the project. This entry was posted in Uncategorized on May 1, 2013 by The Pi Zone. Just trying a quick test using a small 12v battery, feeding into a car usb charger to drop from 12v to 5v. I left the RasPi running for a few hours with no issues. 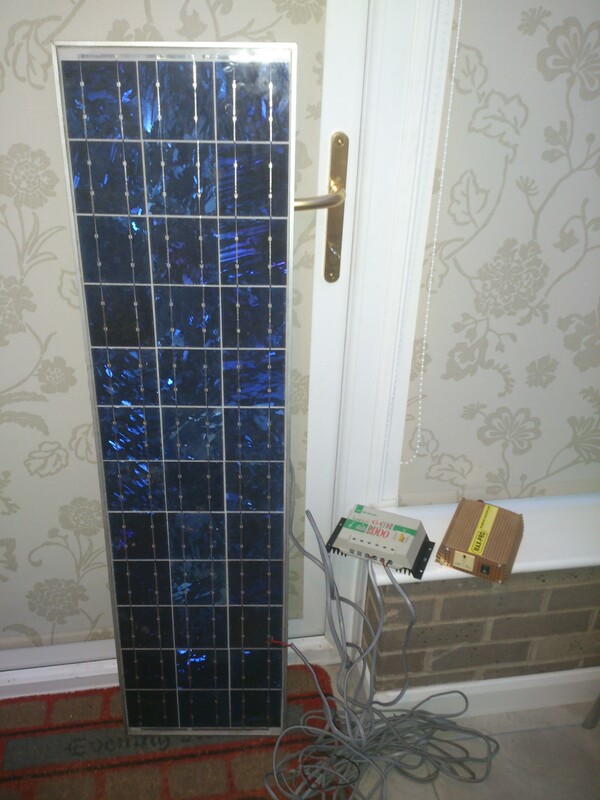 The battery is being charged by a 12v 50watt photovoltaic panel and a 20amp charge controller. I’ve been interested in photovoltaic solar panels for over 10 years now and I’m looking to combine that interest with Raspberry Pi based projects. One of my main goals is to create a number of smaller projects, that the community can be involved and interact with. But it has to be linked to photovoltaics in some way. Most of the project will be comprised of what I already have or can scavenge to keep costs down. This also includes turning part of my garage into a raspi project room and getting all electrics to run off solar/battery bank (currently has no electrics). So far to start the project I have. 2 x 12v 4ah batteries, scavenged from an electric scooter, using these for testing. 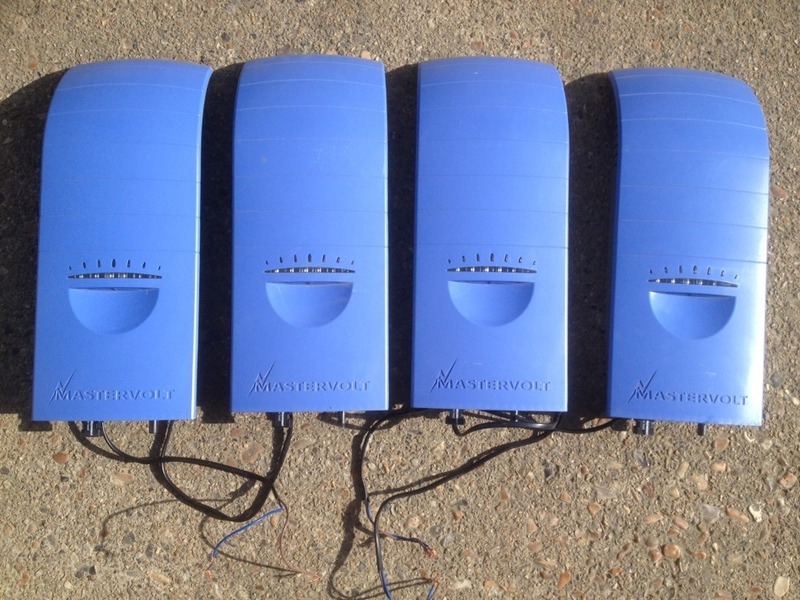 I’ve also got 4 x 24v 170watt solar panels hopefully turning up mid april, that I may use to build a mini grid tie setup using a Mastervolt Soladin inverter. This is an evolving idea/project and will no doubt change over time, as a lot of this will be a learning process for me. This entry was posted in Uncategorized on April 3, 2013 by The Pi Zone.